Choosing equipment can be tricky, but PowerBoss makes that difficult decision a no brainer. 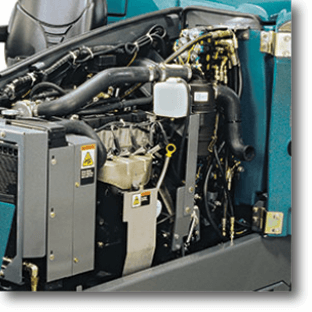 Compared to Tennant’s product line, PowerBoss machines provide the simplicity and reliability you are seeking in power cleaning equipment. Below is a breakdown comparing the ins and outs from a few of the more popular cleaning equipment. For starters, the M20 leaves your service technician with no room to work on the engine which also limits air flow for cooling. As you can see, the Nautilus provides easy access allowing you to work smarter not harder. The M20 also has a cast iron engine block and aluminum head. This combination says nothing but trouble and will leave you dealing with a blown head gasket. 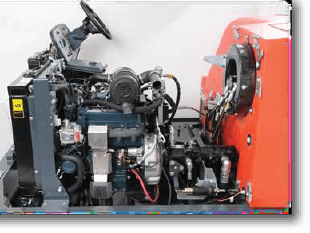 Every sweeper or scrubber is a collaboration of working parts, from the engine down to the control panel. If one aspect of the machine fails, the entire machine malfunctions. The touch pad control panel of the M20 is vulnerable to failure due to heat or cold. The extreme weather leads to cracking and condensation that works its way into the circuit board. The circuit board is a costly and unnecessary repair. The Nautilus keeps it simple and saves you the repairs. There is a huge difference in the Tennant M20 and the PowerBoss Nautilus when talking about the recovery tank. The M20 utilizes a cheap foam lid gasket that is glued down with an adhesive. This gasket has a tendency to absorb water and chemical. The absorption results in the swelling of foam and causes a vacuum leak. Additionally, if the foam is even slightly chipped, the entire foam gasket must be replaced. 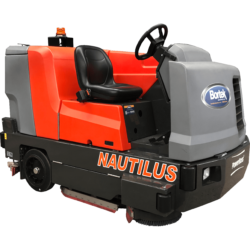 Conversely, the PowerBoss Nautilus is equipped with a heavy rubber gasket giving the tank a firm seal and eliminating those pesky leaks. If the rubber gasket were to break, simply replace the rubber gasket and the Nautilus is good as new! The M20 has a wash out port in the bottom of the recovery tank to remove the solid debris. 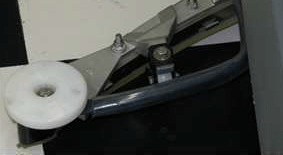 Usually the operator forgets to raise the hopper before washing the tank and all of the solid debris ends up on the hopper door actuator located directly below. The solution and recovery tank is the next major difference when comparing these two machines. 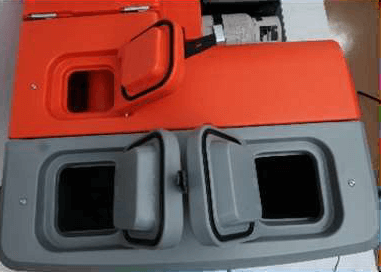 The M20 has small tanks that include the demisting chamber as usable recovery space. On the other hand, the PowerBoss Nautilus provides large tanks. When dry sweeping, nothing is more frustrating than when your paper filter gets wet and clogs. This scenario occurs far too often with the Tennant M20 which uses a paper dust filter. The filter is meant for controlling dust, yet when the filter gets clogged, the machine blows dust! Get rid of these dust filters all together with the Nautilus. 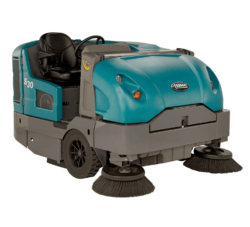 PowerBoss uses water to control the dust while dry sweeping. No filter means eliminating unnecessary filter maintenance and replacement costs. 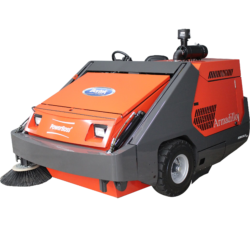 When looking for a scrubber, or any machine for that matter, you are seeking durability, dependability, and something that will last you long term. Plastic is not the answer. The Tennant S30 has plastic body panels and hopper. The panels are light duty and easily susceptible to damage. The PowerBoss Armadillo is proud to showcase a heavy duty steel frame. The design is built to last even in the toughest work environment. Tennant promotes their compact design built for speed and cab forward compartment design. Which is great if your machine never requires any maintenance. The S30 has little to no room to work on the engine making repairs difficult. Once again, this creates poor air flow for cooling. The engine itself presents another problem. The combination of a cast iron engine block and aluminum head says nothing but trouble and will leave you dealing with a blown head gasket. As much as we are concerned about simply getting the job done, safety is always a priority. 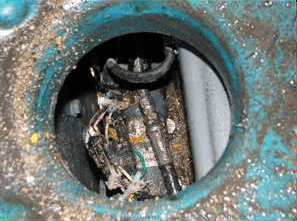 Believe it or not, when dumping debris from your scrubber, it may be helpful to actually see what your doing. PowerBoss has seen through this issue. When lifting the front end of the Armadillo while dumping debris in the dumpster, there is excellent visibility for the operator. 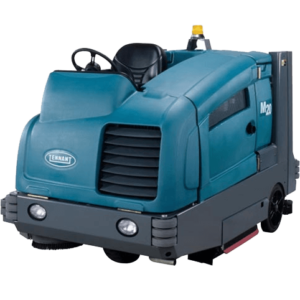 Compared to the Tennant S30, there is zero visibility for the operator. Don’t overlook this safety aspect of your company. When it comes to efficiency, PowerBoss is the way to go! Relatively speaking, the speed of these machines is similar. However, with the Tennant S30 you’ll be spending more time making trips to the dumpster and less time sweeping. 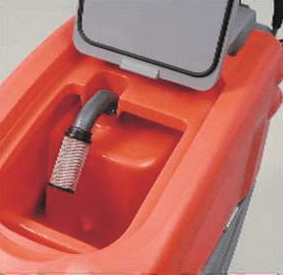 The S30 has a very small hopper bottom, limiting the capacity to 1,000 lbs. The cut out of the duel side brooms limit the hopper floor area for loading debris. The Armadillo saves you that extra time at the dumpster with a capacity of 1,500 lbs. The S30 has a canister dust filter that becomes clogged quickly. This system needs to be removed to be properly maintained. The Shaker system is not aggressive enough to clean the canister filter. 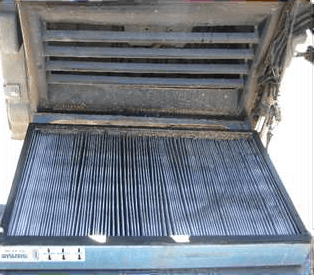 The PowerBoss Armadillo filter shaker system is much more aggressive cleaning the filter and promotes easy maintenance. There is one more major difference in the quality and options associated with the tires for each of these machines. PowerBoss checks both boxes in terms of quality, with the smooth ride tires, and number of options. Choose any of the 23″ tires from soft shoe, non-marking, or pneumatic. 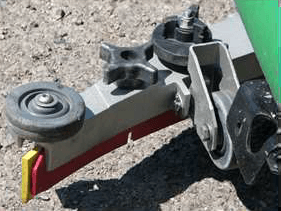 Another popular option is the powerflex suspension system. Tennant on the other hand has one option, a 21″press on tire and wheel. The press on design limits the S30 to these rough ride tires as the only option. There is only one color that stands out to represent safety. For years, construction sites, warehouses, and other hazardous situations have reinforced orange as the gold standard for safe practices. 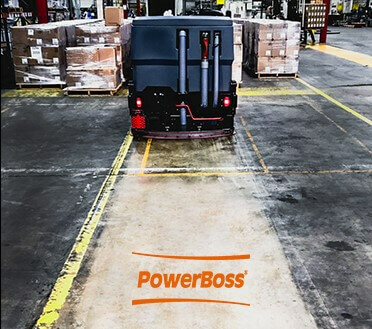 PowerBoss is no exception to that standard, which is why all of their cleaning equipment can be associated with the color orange. The bright color stands out in a dark facility and helps minimize unnecessary injury. Other companies such as Tennant use an aray of colors. The machines above used a blue exterior whereas the Tennant 5680 has a green exterior. Another downfall to the Tennant 5680 is price. The walk-behinds come in a 28″ and 32″ cylindrical unit. The prices for those models range from $13,000 to $18,700. Highest price doesn’t always mean best quality. Get the most bang for your buck with the PowerBoss Phoenix. PowerBoss walk-behinds provide the durability your looking for as with all of their machines. The Phoenix comes with an all steel heavy duty frame for maximum durability. 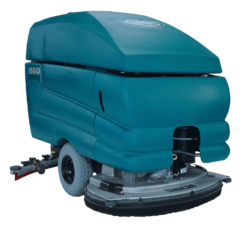 The 5680 comes with a composite plastic frame making the machine vulnerable to the ware and tear of your power cleaning needs. The Tennant 5680, unfortunately, makes your job harder than it needs to be. The battery and recovery tank are located below the solution tank. The solution tank can be heavy when full and therefore the recovery tank is rarely washed out. 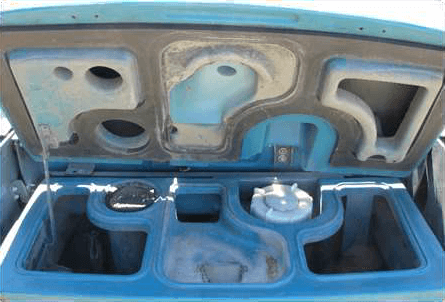 In order to properly wash the tank and/or charge the battery, the operator has to empty the solution tank to open the lid. PowerBoss, however, has designed the Phoenix to be as user friendly as possible. 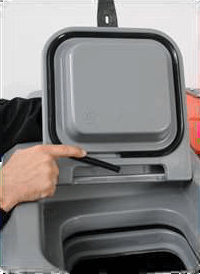 The recovery tank is conveniently located on top for easy wash out and has an on-board charger. In an attempt to seal the recovery tank, Tennant installed two foam gaskets. 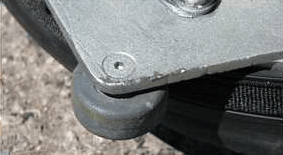 The gaskets are consistently in need of replacement. Any imperfection to the foam gasket and you are left dealing with a wet, unsafe floor and a compromised vacuum. PowerBoss doesn’t hold back. The heavy duty rubber recovery tank gasket ensures excellent vacuum and a dry floor. After spending time cleaning your floors, the last thing you want to do is go back and clean the marks on the wall and floor left behind from your machine. The rollers for the scrub deck and squeegee on the Tennant 5680 are small and no not offer much protection for the machine or walls. 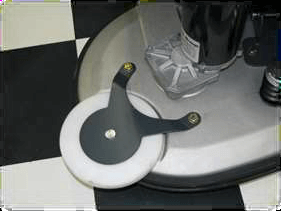 As for the floors, Tennant uses a black rubber tire for the walk-behind scrubbers that may cause marking on the floor. PowerBoss, however, left no stone un-turned for their machines, providing you with the best power cleaning experience you could ask for. 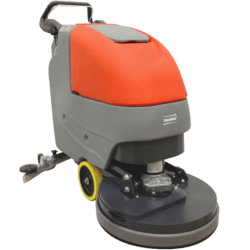 The Phoenix has large non marking rollers attached to the scrub deck and squeegee keeping your walls clean. As for the tires, they provide a special non-marking, chemical resistant traction tire. Please note, all PowerBoss and Tennant logos are the property of their respective companies. Bortek has no affiliation with Tennant. All information shown are based on data shown in literature and web content both companies provide to the public.